Having bought the awesome TTSH and started constructing it I decided I wanted a keyboard to go with it, and the ARP 3620 was the natural choice. So with the guidance of a few fellow Wigglers (AndyRUK and diablojoy - many thanks) on another forum, I built one to the original design but with a different PCB layout on which nearly everything is directly mounted. Whilst the original design could clearly be improved upon to remove the need for the dual FETs as suggested by Nordcore, my limited knowledge of circuit design prevented that. As the cost of one PCB was almost the same as a batch of four, I opted for the four in case I spoilt one or had to modify it in any way. Thankfully that wasn't the case, so I offered up the remainder on the TTSH general build thread hoping I could shift one or two, and have to date had 12 offers for three boards, which obviously means I'll be having another batch made soon. I have revised the PCB very slightly for the next batch to correct lead spacing for the Bourns Ã‚Â¼" trimmers - they fit on the original layout by bending the wiper lead accordingly, but knowing my error I corrected it. I hand-made a panel to go with the PCB, again much to the same design as the original layout and had it powder coated and screen printed, intending that to be a one-off. However a number of Wigglers interested in the PCB have also enquired about the panel, so if I can get an appreciation of numbers I'll get a quote for professionally made panels and offer them up as an option. The screen printing will hopefully be an improvement on mine as it looks like my design was interpreted rather than copied exactly (different font etc.). I'm expecting the PCBs to be in the order of Ã‚Â£25 - 30 GBP each plus postage, but the panel cost is completely unknown at present. If anyone who hasn't already contacted me one way or another about PCBs would like one please post or PM accordingly, and anyone who would like a panel please also let me know so I can get quotes for PCBs and panels. I'll update this post with better pricing when I know more about numbers. This won't be an ongoing offer so I really need final numbers fairly soon. Looks great, but isnt one of the voices the lower voice? Or doesnt it matter since its the same CV in any case? Or isnt it CV out but inputs? Just an FYI, I put a panel together with Front Panel Express and the total comes to around $65 (with the current 20% off promo code). I'm sure it could be done cheaper but I don't have a way of creating HPGL files. Thanks for the info qp. I'll try FPE and Screencraft for panel costs. Another FYI - the very rare IMF3958 dual FETs can be replaced with 2N3958 or LS3958, both of which are available on short lead times from Micross. The Upper Voice is available on both sockets on the panel. The Lower Voice, together with Gate, Trigger and three power rails connect via the 6-core cable connection to the 2600/TTSH. Not sure why ARP chose to do it that way, but it may be because the original 3601 and 3604 keyboards only had lower voice and all six pins were used so kept that as standard and offered twin Upper Voice outputs so you could route them to more than one location. definitely in for one though. I'm already down for on of the three original PCBs, but I'd certainly be interested in a panel too. You were in fact the first so most definitely on the list. Are you interested in a panel too? Nice work! Which keybed are you using? I think we talked about me grabbing one of the original PCBs, but if that didn't happen it's no problem. I would definitely like to buy one regardless. Thanks. It's an Italian-made S.K.A. keybed, supplied and fitted with double key contacts by Kimber Allen in the UK. Any 4-octave (C-C) keybed should do as long as it has dual independent contacts per key and the contacts can be adjusted such that the CV bus contact closes before the Gate bus contact. Yes you're still on the list for one of the first run of boards. In the interests of fairness I'm waiting for a quote for another 10 boards and will spread the cost evenly for all those who'd like one including the three original spares, so it should hopefully bring the price down a bit. Using FPE the rough cost of a panel based on 10 is looking something like Ã‚Â£75 each. I'll get a quote from Screencraft to see what that's like. no panel please, I will have to work out my own as i have some additions to add to the total allocated panel space 600 x 280 mm . will need to work on how much i can fit hopefully i can include a sequencer , a dedicated LFO , a VCA, some logic and a Mixer/Distributor but we shall see how quickly i run out of room. Excellent, thanks for that! I'd love a panel too, and that price is OK by me. No worries - that'll be a beast for sure! The layout for the 3620 controls was posted on the general build thread recently - grab it from there if you haven't already. I'll post it up here too with the BOM shortly. 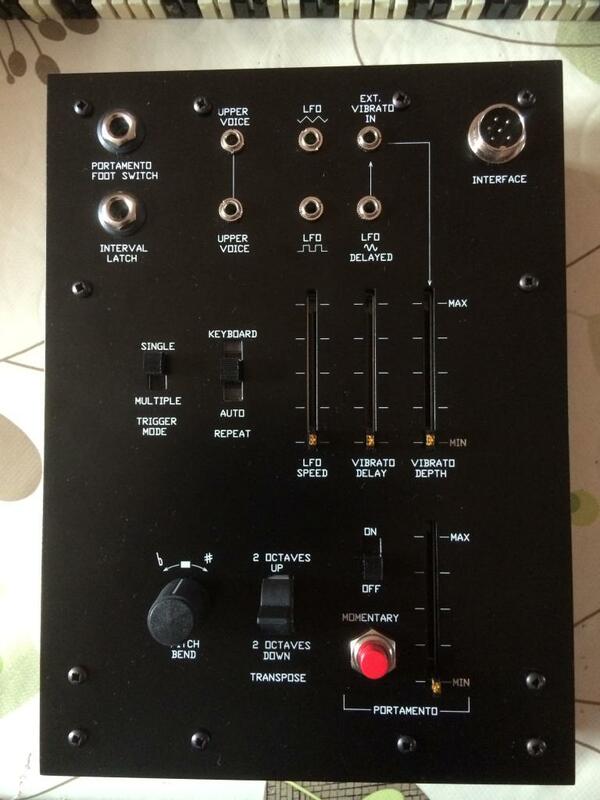 If zthee comes up trumps with his proposed sequencer/expansion unit I'll definitely go for one, but if not I may well have a go at that myself. Nothing innovative - just a straight copy of the original schematics (with the resistor chain package replaced by discrete precision parts), apart from the LED sliders as my circuit design capabilities are severely restricted, plus an LFO pulled from the 3620 and ADSR section from the TTSH/2600 (with zthee's consent of course). Like the 3620 it would be intended as a personal project, but I may be pursuaded to share it. No promises whatsoever though - time is one thing I don't have enough of. Update on PCBs: I have just ordered a batch of 10 boards to go with the three I already have, and the price works out better than expected so I'll be offering them at Ã‚Â£20 GBP each plus postage. 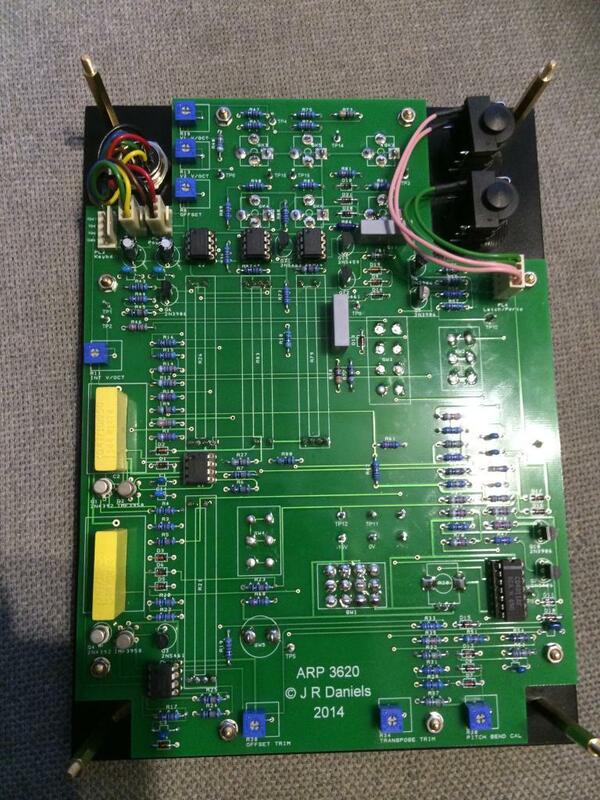 There may be a couple of spare boards too as the manufacturer always makes a few extra and sends them out FoC if they all pass the tests, which they did on the first run. So at present I have requests for 12 boards out of the 13 (plus a couple of extras hopefully) I have available, so if you're interested and haven't already been in touch, get in quick as I'm unlikely to do another run unless I get another 10 requests. Given that the polycarbonate 470nF capacitors (Philips type MKC344) are hard to find, I've just bought a load from Poland so will include a pair of them with every board at no extra cost. The toggle switch I used has been discontinued, but there are substitutes. Mouser have six 633-M2044TNW01 bare switches due in stock on 11th August, but the PC-pin variety 633-M2044TNW03 is available in large numbers on 10-day factory turnaround. I have not tried the PC-pin type as I didn't know it existed at the time I designed the boards (mine uses a fixed toggle solder tag version hence the large pads), but it should be OK on the PCB as the pin spacing is identical, with a bigger blob of solder. You will need to ensure the switch sits as close to the PCB as possible so may have to file off the shoulder on the pins if it doesn't fit down flush to the board without. For either of these two alternatives, you will need a separate toggle to go with it, type AT4149. The white one is Mouser part 633-AT4149B. I'm still working on panel costs and need an idea of numbers. I'll PM all those who've already reserved a PCB with the option for a panel. edit: correct BOM replaces old out of date version. Thanks for doing this for us, Kipling. One minor thing - would you consider adding the "connector" socket to the BOM as well? And maybe the plugs for building up a cable, which we'll all presumably have to make up as well. Attached is the right version. kipling, don't count me for a panel. I'm going to order the one I drew up in fpd. The conversion rate will cost the same as me ordering 2 panels! If so, count me in!!! You are the 13th of the 13 PCBs I have available, luckily for you, although there may be a couple more spares when they arrive in about 10 days or so. I'm working on getting a few panels made by popular demand, but nothing's finalised on that yet. I'm hopeful there'll be a small number of spares - the PCB manufacturer always makes a few spares in case one or two fail testing. My first order was for 2 but I received 4, so with an order for 10 there may be 3-4 spares. You're certainly top of the reserve list. Would you be interested in a panel too? For the avoidance of any doubt, the PCB will NOT fit a 3601/3604 standard case, being just a few mm too big in both directions - something I wish I knew before I designed it.